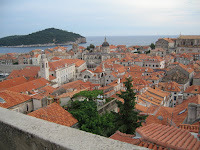 Dubrovnik was designed for women who love stilettos. The streets and buildings are made of a gorgeous pieces of white marble, which have no cracks or bumps in between them (so stilettos can be worn without getting stuck in the stones). The old town was rebuilt in the 1990's, after being destroyed in the war. This was a smart investment by Croatia as many tourists visit here. 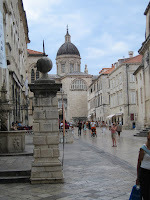 The end result is a sleek and stylish old city, which brings in lots of tourists. Around the old city are the original fortress walls. Visitors can walk around the top of the old fortress walls and have a glimpse of the whole town and of all the yellow and orange rooftops (yellow = old roof, orange = newly re-roofed... see pic above). Hiding throughout the city are small, cute corners with restaurants, bars and fountains of fresh, drinking water. Pic 4 (above) shows an amazing location just on the outside of the fortress walls where people can sit, watch kids jump of the rocks into the water, and enjoy the sunset. Ironically, there is a sign in the alleyway on the way to this bar saying "no nudists." Apparanetly nudism is a common theme in Dobrovnik. 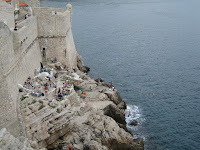 There are 2 beaches in Dubrovnik: 1 sandy beach (sandy beaches are not common in Croatia) and 1 stone beach. As it was 100 degrees when we visited, we decided to go swimming. We were told by our hosts to visit the 2nd (stone) beach because it was cleaner, less crowded and also has a cave, with a fresh water spring, where people can swim. We were told to avoid the sand beach as it is dirty and gets too crowded. Taking the advice, we set-off by boat to a nearby island where the 2nd beach is located. When we got there, we learned why it is less crowded... it is a nudist beach. A nudist beach full of gay guys to be exact. 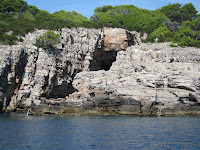 Not wanting to miss out on swimming in the cave, and too lazy to walk back to the dock and wait for the next boat back to Dubrovnik, we set-up camp at the beach (or rock-slabs would more accurately describe the "beach"). This turned out to be a smart move. The water was great, the cave was cool (except for the dead fish where the salt and fresh water meet), our neighbors were very smart and interesting to talk with, and not once did anyone even look our way. From our spot on the rocks, we were able to overhear some very interesting discussions including the pro's of gay rights in Canada, 2 (Italian?) men - 1 older & big, 1 younger & in-shape, flirting vicariously with each other and discussing how they declined further comment during an interview, and modern European Architecture. Definitely an afternoon well-spent. Natives to Dubrovnik are very nice. The owners of the B&B in which we stayed forever asked us if they could help us (and even brought up grapes and pomegranates fresh from their garden). The 20 yr old son of the owners spent much time trying to figure out if how old we were and if any of us are single. The whole family gave us great tips for places to see. All in all, it was a very entertaining visit. One thing to note if you visit Dubrovnik in summer... find a place with A/C!